How much does it cost to join Elite Racing Club? Are there any hidden costs on top of the £199 yearly membership fee? Do I have to renew my membership at the end of my membership term? If I decide to renew my membership will I get a loyalty discount? Can I choose which day the membership starts on? If I purchase a membership for someone else, am I able to have the membership pack posted to my address or does it have to go to the new Member? What's in the membership pack? How often will I receive an Elite Racing Club Magazine? Is it possible to visit the Club's horses? Can I bring guests to Club stable visits and hospitalities? As a Member, am I entitled to enter the parade ring/winners enclosure when a Club horse runs? Are Members entitled to discounted entry to racecourses? Are Members involved with the naming of new horses? Does the Club provide any betting information for Club horses? What is the Five Star newsletter service? 1. How much does it cost to join Elite Racing Club? One year's membership to Elite Racing Club costs £199, which is paid at the start of your membership period. However, if you wish to spread the cost, you can opt to pay the fee in four quarterly instalments of £52.25 each, making your first payment at the start of your membership and then a further three payments at three-monthly intervals. The cost of membership when paying quarterly is £10 higher due to the greater degree of administration involved. 2. Are there any hidden costs on top of the £199 yearly membership fee? No. Other than the £199 annual membership fee, there are no other compulsory costs involved in your membership. You certainly will not be billed to cover any of the costs for training or caring for the Club's horses and visits to the stables to see the Club horses are usually free for Members. 3. How long does membership last? Membership to Elite Racing Club lasts for a full 12 months from the date your application is processed (or from a specific start date if one has been chosen). At the end of the year, you will then have the option to renew for a further year. 4. Do I have to renew my membership at the end of my membership term? No. 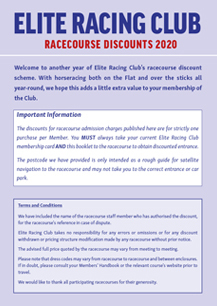 Although we hope that you will want to remain a Member of Elite Racing Club, you are under no obligation to continue with your membership once your initial yearly term has come to an end. 5. If I decide to renew my membership will I get a loyalty discount? Yes. We offer a loyalty discount scheme where the annual cost of your membership will decrease, based on the number of years of continuous membership with us. This loyalty discount can increase to a generous maximum of 40% off the standard membership fee. 6. Can I buy a membership for someone else? Yes, you can purchase Elite Racing Club membership as a gift for someone else. When you purchase the initial year of Club membership, ensure you make the name of the person the membership is for very clear as well as the address their newsletters will be delivered to each week on the application form. Please also include your own name, address and a contact telephone number in case we need to contact you about the membership. If you are purchasing the membership over the phone, simply provide our member of staff with all the same information as above. 7. Can I choose which day the membership starts on? Yes. If you would like a year's membership to begin on a particular day, such as Christmas Day or a birthday if the membership is a gift, simply state this on the application form or inform our member of staff if purchasing the membership over the phone. 8. If I purchase a membership for someone else, am I able to have the membership pack posted to my address or does it have to go to the new Member? If you have purchased an Elite Racing Club membership for someone as a gift, you may wish to give them the membership pack yourself. If so, the membership pack can be delivered to an alternative initial delivery address. Please note that you should then ensure that you choose a date for the membership to begin that falls after you have given the new Member their membership pack, because newsletters will be delivered to the new Member's address weekly as soon as their membership commences. If ordering the new membership by phone, simply inform our member of staff of the address you wish the membership pack to be delivered to and the date you wish the membership to begin. If you are ordering by post, state clearly with your application the address you wish the membership pack to go to as well as the date you would like the membership to start. 9. What's in the membership pack? The Elite Racing Club membership pack provides you with a wealth of information, starting with your welcome letter, which contains your membership card as well as important membership details, such as your membership number and the unique identification codes you will need to access our exclusive telephone information hotline and online services. Also enclosed in the pack will be two of the latest Club magazines, plus a selection of very useful publications. Members Handbook - this book has been designed to help you to enjoy your membership to the full. It is packed with information about Elite Racing Club and includes full details about all of the many benefits of being a Member. 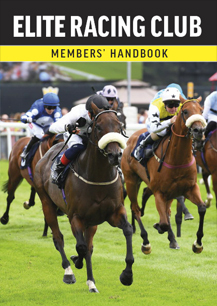 There are also sections such as the 'beginner's guide to going racing', a general betting guide and a glossary of horseracing terms that many Members find useful. Horses In Training - this publication is printed twice a year (usually in April/May and October/November) and contains details of all of the Club's horses in training and information from the trainers including their plans for each horse's future. 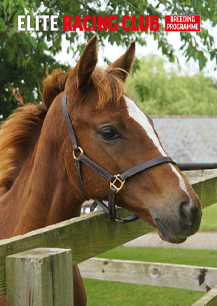 Breeding Programme - this annual publication features details of all of the Club's broodmares, foals and yearlings as well as information about the covering sires used for the year. Racecourse Discounts - many British racecourses take part in our Racecourse Discounts scheme, where Elite Racing Club Members can receive discounted entry to certain racecourses and meetings during the year. All of the participating racecourses on all or selected fixtures during the year can be found listed in this booklet. 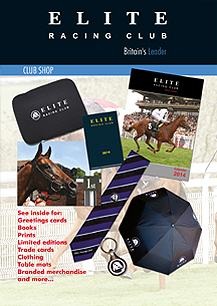 Club Shop - this booklet features the wide variety of exclusive Elite Racing Club items we produce for Members to purchase, from the popular calendars and diaries, to prints of some of the very best photographs of Club horses. 10. How often will I receive an Elite Racing Club Magazine? The Elite Racing Club magazine is published weekly and is posted out with the aim of reaching Members on a Saturday. We aim to publish 48 magazines each year. Stable visits to the trainers' yards where the Club's horses are based are organised by the Club throughout the year and we aim to visit each yard at least twice. 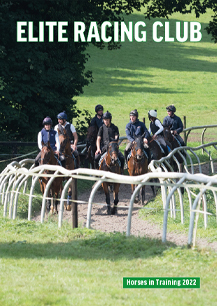 Depending on the facilities at the particular yard, Members can usually see a parade of Club horses, or watch them working on the gallops. There may also be a stable tour, or sometimes a question and answer session with the trainer. These visits are usually free for Members to attend. 12. Can I bring guests to Club stable visits and hospitalities? Yes, Members are welcome to bring guests to both stable visits and hospitalities. Please note that for some very popular events, or where there is limited availability, the number of guests each Member can bring may be restricted. There is also a small fee charged for guest places at stable visits and hospitalities. 13. As a Member, am I entitled to enter the parade ring/winners enclosure when a Club horse runs? In order to enter the parade ring/winners enclosure at the racecourse, you must have an Owners & Trainers badge. The Club is allocated a number of these badges by the racecourse when there is a Club runner. Members can then apply to be entered into the ballot to secure one of these badges. Note: You should never enter the parade ring/winners enclosure without a valid badge. 14. Are Members entitled to discounted entry to racecourses? Many British racecourses take part in our Racecourse Discounts scheme, where Members can receive discounted entry to certain racecourses and meetings during the year. 15. Are Members involved with the naming of new horses? We often hold competitions asking Members to suggest names for Club horses and yearlings, with a cash prize awarded to the supplier of the chosen name for each horse. However, this is not always the case and not every new horse is subject to a competition for naming. 16. Does the Club provide any betting information for Club horses? For Club runners, the very latest information from the trainer about the horse and its chances in the race are provided via the Club's telephone information line and the Five Star newsletter. We will also provide what we consider to be a 'value for money' price for the Club runner in that race, although it should be noted that we are not privy to information on other runners in our races. 17. What is the Five Star newsletter service? The weekly newsletter is somewhat time sensitive due to the time it takes to write, print and post, so the Five Star newsletter service was set up to help keep Members as up-to-date as possible with Club runners. It also contains details of upcoming entries, Club news and the latest results. The newsletter is available to view free of charge on the Members' website, but if you would like to subscribe to the posted version, there is a small fee to cover administration and the cost of first-class post. The Five Star newsletters are sent whenever the Club has a declared runner, or at least twice a week. Do you have a question that isn't answered in the list to the left? Use the form below to send us your questions. Enter your question in the text box below.